Several updates to this ongoing cryptocurrency story in China and elsewhere (each subheading below is a slightly different topic). Yesterday Bill Bishop linked to a story posted at Sina, “虚拟货币本质上不是货币” written by Sheng Songcheng. Mr. Sheng is the head official of investigation and statistics at the PBOC (the central bank). In addition to Bishop’s nutshell, another tl;dr comment that I would add is this, because Mr. Sheng works for the PBOC, his essay pretty much encapsulates what that important organ of the government thinks. Based on his essay, they do not recognize Bitcoin’s legality (although there is no clear indicator that they see a difference between protocol and token) and according to his own words, without government oversight or backing by any country, the token itself has no value. Mr. Sheng uses the example of the recent 60% price drop of the bitcoin token on BTCChina last month as proof that without government approval, it has little value (a correlation-causation fallacy). Furthermore, he thinks that if there is a developing country (such as China) that does begin using it, the deflationary aspect (the fixed ‘money’ / token supply) would actually present an obstacle and hinder the country’s economy to grow. In fact, he says that Bitcoin and other cryptocurrencies will never become a country’s major currency and as a consequence, will not be a “real” currency. And that it could only become so in the “utopian view of technocrats and libertarians” (技术至上主义和绝对自由主义者的乌托邦). Yes, he uses the Chinese word for idyllic libertarian (绝对自由主义者). From a technical viewpoint, he states all cryptocurrencies do not have a unique origin, nor are its token generation, exchange and storage methods particularly special. Any currency that has Bitcoin’s features could replace it such as Litecoin, which the public has become familiar with. And continuing, he states that Bitcoin does not have any physical attributes found in gold and silver nor exclusivity enforced by the law so it will be really easy to replace. Therefore it cannot replace the role of general currency which is the medium of trading. Thus his overall attitude (and that of the PBOC) is that the central government does not recognize any specific values of the token; that it is illegal to use (though he does not specifically say who or what timeframe) and it doesn’t justify its own existence. Again, while we can argue over the epistemological, economic and technical problems with this essay (e.g., why do economies grow, deflation versus inflation [pdf], the economics of Bitcoin [pdf], what utility cryptocurrencies have, how the protocol works, etc.) all of which have been discussed elsewhere, as Bishop noted above, this essay is hardly a positive sign for the crytpocurrency segment in China. Thus, while speculative, after reading the article the impression readers are left with is that the PBOC will crack down on cryptocurrencies on the mainland for the foreseeable future. There have been discussions over the past weeks as to how mainland exchanges could bypass the current hurdles. One idea was to create yet another type of virtual token that could then be exchanged on exchanges. Over the past couple of hours on reddit, users have posted a new method that BTCChina is using to get around the current depository predicament the mainland industry is currently in (e.g., all payment processors are barred from providing fiat liquidity to crypto exchanges). 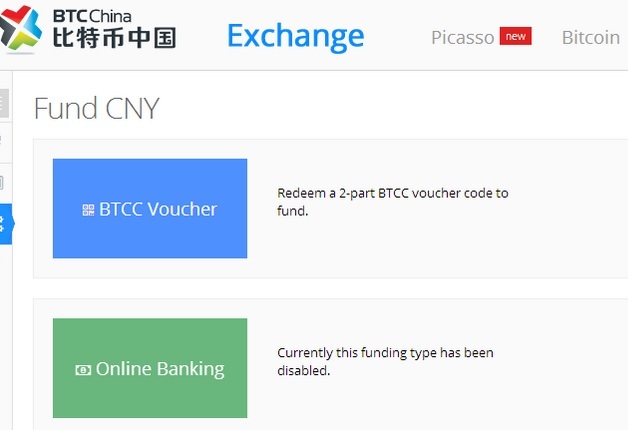 However, the small stop-gap solution is for BTCChina customers internally (this is not the same thing as the online vouchers like BTCe has). BTCC code is to allow one customer with CNY on the site to sell the CNY to another customer. The medium is the BTCC code which is in two parts: one is for the customer the other is for the site. Imaginary Capital Markets has a few more details and screenshots, but let me just emphasize once more that this is not a complete workaround (yet) but just a way for BTCC users to exchange CNY with one another. My speculation: if the CEO role as sole depositor is still active, perhaps this could be a way for him/her to distribute funds to friends & family who can then exchange the fund to the wider customer base. If this is the case, perhaps other exchanges will follow suit (assuming that the CEO can still deposit funds into the exchange through their personal account, see the explanation here for more). Regarding the purported fudged numbers on Chinese exchanges (discussed here), another friend (in Europe) recently wrote to me explaining that someone could easily write a bot and test the liquidity to see whether it is real or not. It could be that some exchanges on the global stage act as a market maker (similar to the NYSE which employs “specialists” [pdf explanation] who always make sure that there is a reasonable bid and ask available and who take short term positions in order to provide liquidity). This same friend who has both mined and then built proprietary HFT arb software on BTCe is reasonably sure that BTCe runs their own arbitrage bots with zero fees but sometimes turns them off (or they have certain limits, he is not sure). Again, arbitrage is not bad per se and basically makes sure that you can execute your orders at a ‘fair price’ all time. Of course it would be better if the exchanges are more forthcoming about what they do behind the scenes but as long as there are no regulations they can do whatever they want and earn some extra money. Yet again, no one is forced to use a particular exchange so people can easily vote with their feet or open their own (transparent) exchange. It occurred to me that the argument about bitcoin having a big “carbon footprint” is really poorly thought out. Is the footprint really bigger than that of paper currency, which has to be transported from countless businesses to bank’s safe deposit boxes at the end of each day. And think of all the gas people must burn on trips to ATM’s! This is in response to my explanation of Charles Stross’ contention that cryptocurrencies are more of a burden on the environment than fiat currencies are (they are not). Mark’s comments are empirically valid because these up-armored vehicles (typically Ford 550 chassis or similar classes from competitors) are frequently used to move fiat currencies to and from distribution centers to branch banks and ATMs. For example, The Armored Group currently lists many used armor transportation cars for sale. And a quick search on Fuelly gives you an idea of how much fuel the average F550 consumes in the city (~9 mpg). This also ignores the supply chain needed to build the vehicles in the first place which is an entire logistical segment that cryptocurrencies do not need. Nor does it include the carbon consumption of the driver and guards ferried around in the vehicles (e.g., eating, sleeping, shelter, etc.). One can only imagine the sheer number of vehicles in developing countries where digital fiat are not nearly as common and thus paper/metal is transported more frequently. Again, this is not to say that cryptocurrencies are mana from heaven, that they won’t be replaced or will somehow axiomatically usher in a world of milk and honey. But these specific claims by detractors need to be backed up with real numbers as they are positive claims (e.g., burden of proof). If you do think that the Bitcoin transaction network (the most computationally powerful, public distributed system currently)2 consumes more carbon than all ~200 fiat currencies right now, you need to prove that. And from my quick research I detailed in my article, that does not seem to be the case (today). Also, for other occasional commentary on crypto in China I recommend visiting my friend’s site, Aha Moments (specifically this recent post). Drop him a note and tell him to update more. Share the post "Cryptocurrency Cat-and-Mouse games in China"
This entry was posted in Bitcoin, China, Cryptocurrency, E-commerce, Economics, Finance, Legal services, Litecoin by Tim Swanson. Bookmark the permalink.